There was Gary in his emergency room bed, still recovering from unexplained excruciating pain, and the first thing he said to me when I arrived was, “How do you find all these places?” I hadn’t seen Gary in over a year, but he had been reading my blog, and—ever thoughtful and curious—wanted to know how I set up my service opportunities. Gary is the father of a very dear friend, Shannon, and the grandfather of Shannon and Cole’s daughters, who are my goddaughters (got that?). He is someone I’ve developed a special fondness for in the short time I’ve known him. He has been supportive in my quest to be of greater service, and knowing that he has enjoyed reading this blog is like having the approval of my own father. 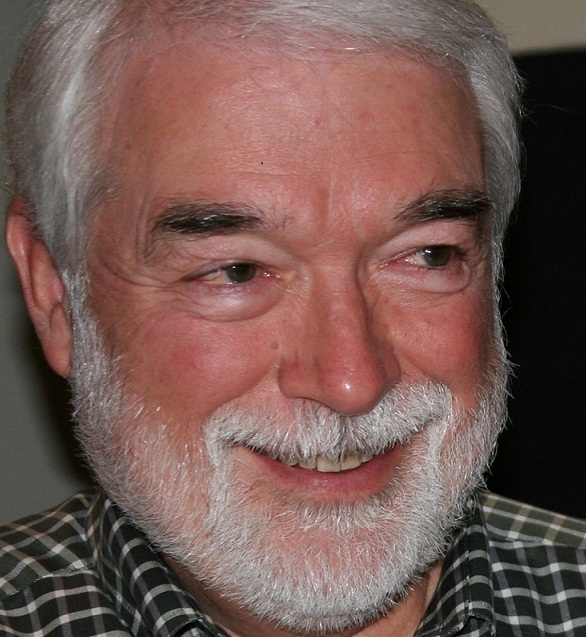 For Gary to want to talk about my blog with me right then and there was a gift of immeasurable value to me, a huge lesson in looking outward, being present, and attending to others, rather than focusing on his own suffering. When Shannon told me that Gary’s cancer had taken a turn for the worse and that it could be helpful to have me there, the timing was serendipitous. I had already taken the days off work to spend with relatives in Tampa before attending a conference in Orlando. It was easier than I expected to change my flights and go to Kansas City, while planning to visit Tampa later this year instead. As a side note, I had also been having a hard time finding a volunteer opportunity in either Tampa or Orlando during my available dates. I had tried unsuccessfully to find a way to support a voter registration drive, given the restrictive new laws in Florida that are disenfranchising poor and minority voters. And so on this occasion, I realized that often we don’t find the opportunities to be of service; they find us. (1) I go to Idealist (idealist.org). This is an amazing organization whose mission is to create “a world where all people can lead free and dignified lives, every person who wants to help another has the ability to do so, and no opportunities for action or collaboration are missed or wasted.” They act as a connector, a clearinghouse, a network of service organizations and opportunities. On their website, you can search by key word, location, and more, to find jobs, organizations, volunteer opportunities, events, resources, and programs of interest. That’s how I found St. Stephen’s Pantry in Delaware and learned that they had an opportunity I could plug into on the morning I’d be in Wilmington. (2) Good old-fashioned web searching. I use Google or Bing to find out what’s going on at my destination the dates I’m there. I’ve tried a variety of search terms, such as “volunteer” + “[city, state]” + “[month, day]” + “2012”. When I searched various permutations of “volunteer” + “Bismarck, ND” + “May 19” + “2012”, I didn’t find any obvious candidates, so I broadened my search to “North Dakota” (not just “Bismarck, ND”) and that’s when I found the state’s extremely comprehensive tourism site (www.ndtourism.com/whatdo/events/) with a complete calendar of virtually every event happening anywhere in North Dakota for every day of the year. That’s how I found the Prairie Places Festival (about 90 miles outside of Bismarck). (3) Haven’t had to resort to this yet, but if those methods fail, I may try networking through Facebook, or I’ll just show up and see where I can be of service. 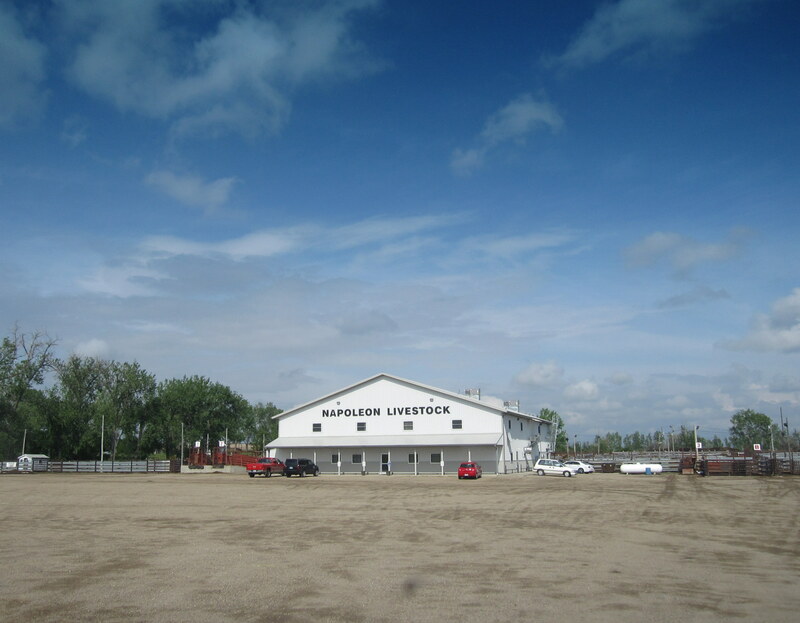 By my second day in North Dakota, I had a realization, obvious to probably everyone but me, that this is an important time for historic preservation in North Dakota. The oil boom is bringing a kind of prosperity to small towns in western North Dakota, like Williston, and at the same time, “new roads, pipelines, and drill sites are slicing the prairie” (see “Growing Pains: Scenes from the North Dakota Drilling Boom” in onearth magazine, May 21, 2012. [Also see “Bad News for the Badlands,” a New York Times article that came out the day after I published this post]). Beyond the strain of a population boom, new wealth, and environmental pressures, it occurred to me that cultural and historical treasures are threatened in the stampede. 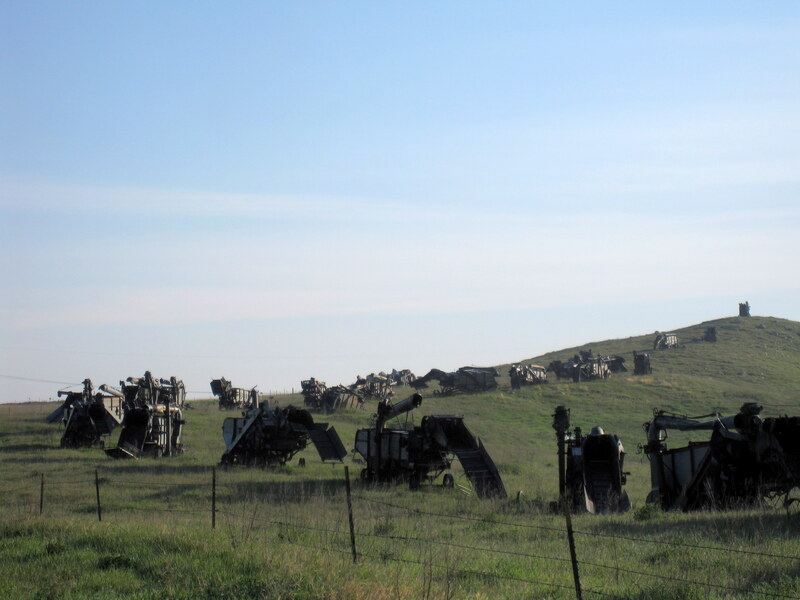 This makes the work of Preservation North Dakota even more critical, and worthy of support (donate here). Dinosaurs on the Prairie. 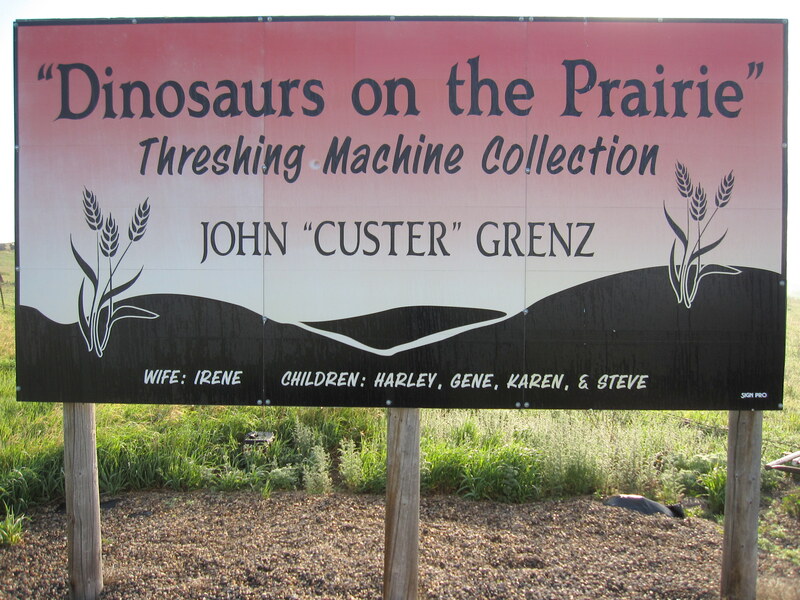 I woke up early enough to be able to visit Dinosaurs on the Prairie, a collection of old threshing machines arrayed in a parade up a hillside about 4 miles or so out of Napoleon. Birds galore sang in the fields all around as I stood there contemplating the miles and miles of prairie those machines and their drivers had traversed over the many years of their working lives. It was peaceful and awe-inspiring in that very solitary, almost desolate, way. …More caravanning! To Lake Hoskins with a monument to early settlers, to the Ashley Jewish Cemetery with graves of 21 settlers mostly from the Ukraine, and to George Station German Baptist Cemetery, tucked away off the highway, off a gravel road, down a dirt/grass road, and behind a couple fences and cattle guards. 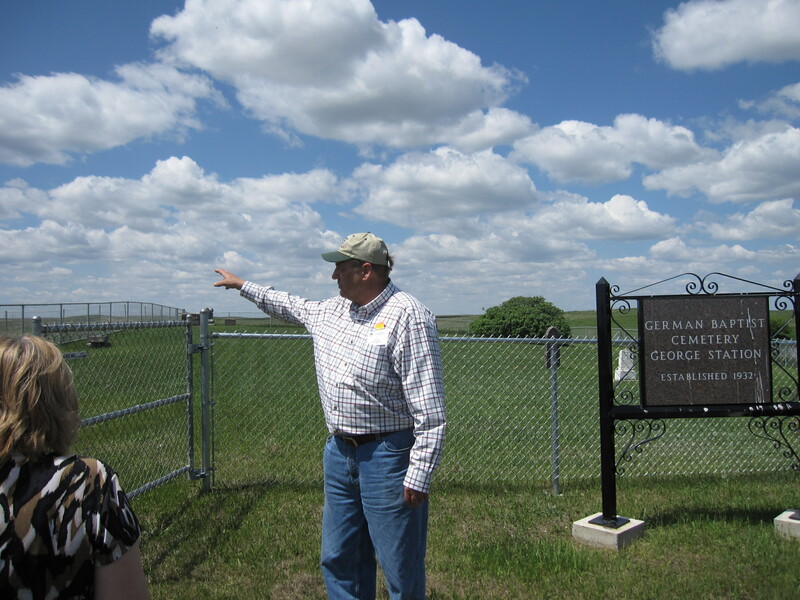 Our trusty tour guide was Tom Isern, Professor of History and University Distinguished Professor at North Dakota State University, a big, tall, fatherly sort of man and a fount of knowledge about local history, geography, and customs. By the time we arrived, it was already time for me to leave. 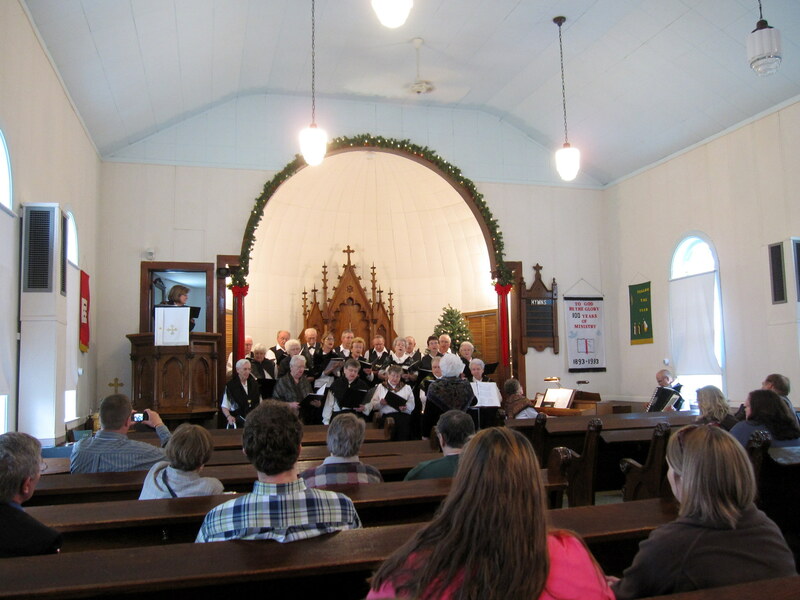 But I had to get to the Lehr Tabernacle to say goodbye to Suzzanne, who had gone ahead to meet the caterer for lunch. After stepping in some fresh cowpies (not once, but twice) as I opened and closed gates of the two different enclosures on my way out, and losing valuable time cleaning it off, I sped on to Lehr. I had no idea where the Tabernacle was, but a friendly local who must have had better things to do escorted me in his truck some distance to the outskirts of town where I found Suzzanne and the others. 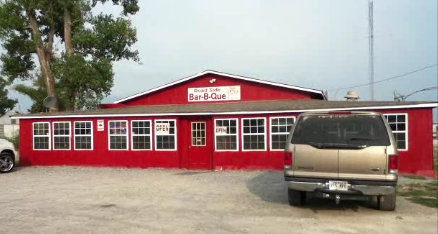 I was obliged to stay just long enough to wolf down a lunch of roasted chicken, baked beans, potato salad, and (yes!) jello dessert (made with sour cream and blueberries—I’ll admit I had been skeptical but it was quite tasty!). In a rush, I hugged Suzzanne goodbye, and then Debbie Marquart approached me to go out to her car and give me a copy of her book, which she autographed for me. I waved goodbye to everyone and took off as fast as I respectfully could on the church and Bible camp grounds. As I got to the highway, the caravan I had left at the cemetery was approaching, and I waved goodbye to each car as it turned into the drive. What a perfect ending to a moving and memorable two days! The power of service to create connection. I really became aware of how my tendency to sit back and relax, except when I have an assigned role or am called upon to do something, at times prevents me from connecting with others as deeply as I am capable of. The value of giving and getting. Of course, the conference organizers had already planned everything as much as it needed to be beforehand. It wasn’t as if they were just waiting for me, a totally unknown quantity, to show up and somehow save the day. I was able to make myself useful, yet in the end, I know I got much more out of the experience than anyone else, despite being thanked profusely (and even being told at one point I was a “lifesaver”). I received so many praises, kind gestures, stories, and even the gift of Debbie’s book—not to mention all that I received as a conference participant. Why did I start out thinking that I had to prove my value by providing some “essential” service? Indeed, why was I thinking that I had to prove myself in the first place? Does receiving benefits through giving diminish the act of giving in any way? Is it ever possible to give without receiving, or is the question just a mind trap? Is it better to give AND receive? I’m having a blast, learning a ton, and meeting really interesting people. And eating food I’ve never had before: salt pork ribs, knoephla soup, and authentic kuchen. I thought about calling this trip “Gopher in North Dakota” because that’s basically what I’ve been doing—I am an all-around “gopher,” including driving the conference organizer to meet the dinner caterer, assisting a guest speaker with audio-visual setup, and helping the caterer carry leftovers back to her car. 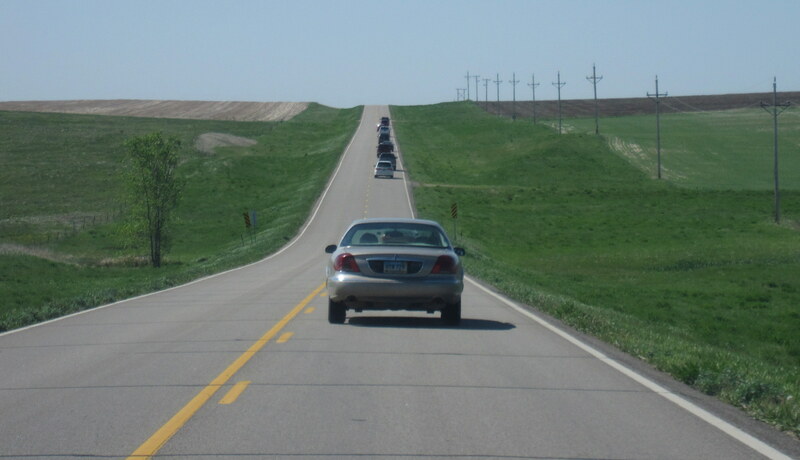 Caravanning (10 cars or so) across the prairie to St. Andrew’s Lutheran Church and Cemetery outside of Zeeland, ND, a historic Lutheran church (actually two churches) built in 1893 and 1906: We heard the story of German migration to the Black Sea area of Russia, and then to the prairies of North Dakota, punctuated by hymns in the local German dialect sung by the church choir, almost all elders whose parents or grandparents had migrated. Singing “America the Beautiful” all together at the end was a most fitting way to conclude a truly moving story of grit and cultural preservation. This legacy, a source of enormous and well-deserved pride for the locals, is enduring yet vulnerable. Afterward they hosted us in the stone church for coffee and delicious cookies. Getting to tour the area with Suzzanne Kelley, a key conference organizer and past president of PND: Suzzanne was the one who responded enthusiastically to my request out of the blue to help with the conference. 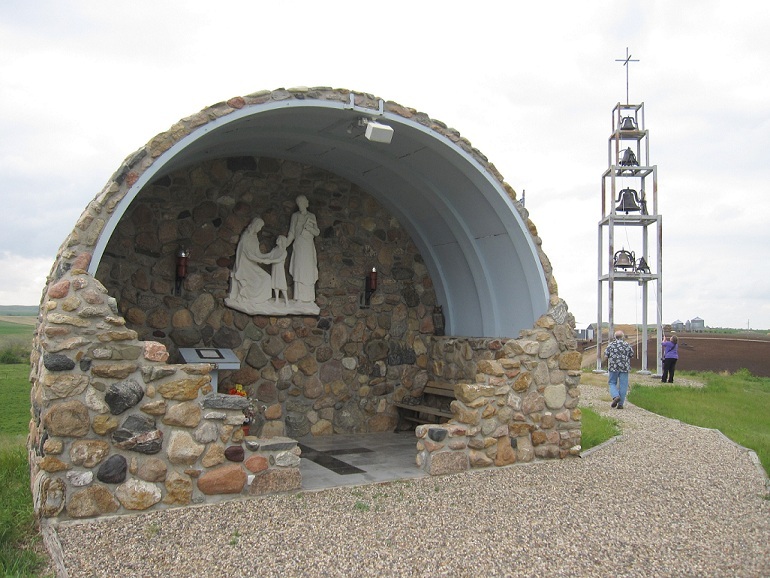 We went to see the Prairie Bells (preserved from three local church buildings that no longer exist—you can ring them, and we did!) and Grotto of the Holy Family (inspired by Italian grottos). 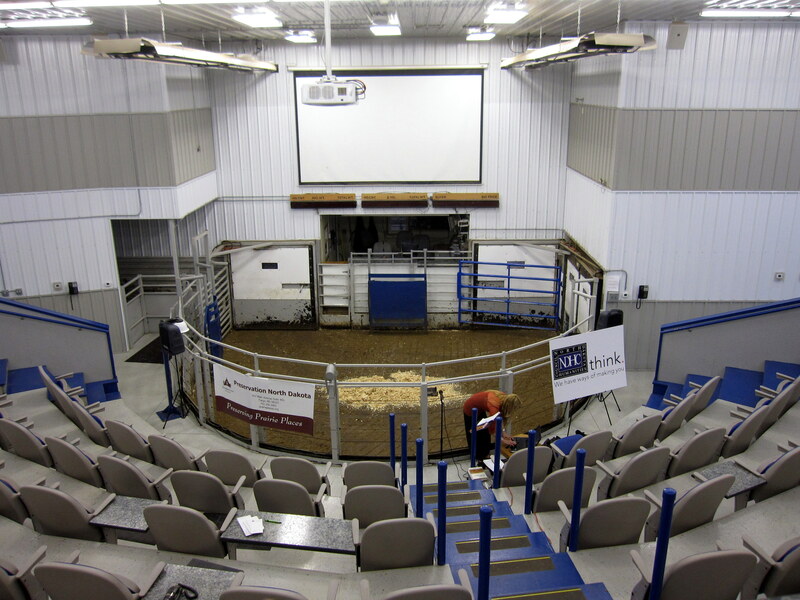 Dinner at the Napoleon Livestock Auction Barn, not a restaurant but as the name says, a real livestock auction barn: I got to help Debra Marquart, born in Napoleon and now professor of English at Iowa State University, set up for her plenary session, drawn from her memoir, The Horizontal World: Growing Up Wild in the Middle of Nowhere. I’ve begun reading it, and not only is it well-researched historically, it is also poignant, keenly observed, and unflinchingly honest. The perfect way to complete my cultural immersion in this unique area of the world. A big theme of today has to be community. Before I arrived, I wondered how I would be seen as the “outsider” and how I would fit in—my typical mental construction about unfamiliar people and situations. In just a few short hours, I was able to join the community by offering my support. People have been genuinely open to newcomers like me as well as old buddies. I’ve been taken in by everyone I’ve met, with friendly curiosity about who I am and what I’m doing here. There were times I noticed myself pulling back, hesitating. I wanted to relax at times (as in slack off, which is something I also do in groups—“someone else will take care of it”). When I noticed myself falling into the old habit, I reminded myself that my job here and now is to help out. So I kept offering to do more, and the result is that very satisfying exhausted-contented feeling (like a “runner’s high,” except connected with other people instead of solitary). I had more fun than I’ve had in long time both helping out and caravanning around the prairie with a bunch of new friends. If today was the main course of salt pork ribs, Day 2 in North Dakota is the jello dessert, coming right up. Tuesday, May 8: How hard can it be to hand out food? People show up, you hand them food, they walk away with it, and one hopes that it enhances their sense of personal security that day, however slightly: they have food to eat for a few more days. Turns out that it’s pretty hard work—both mentally and physically. 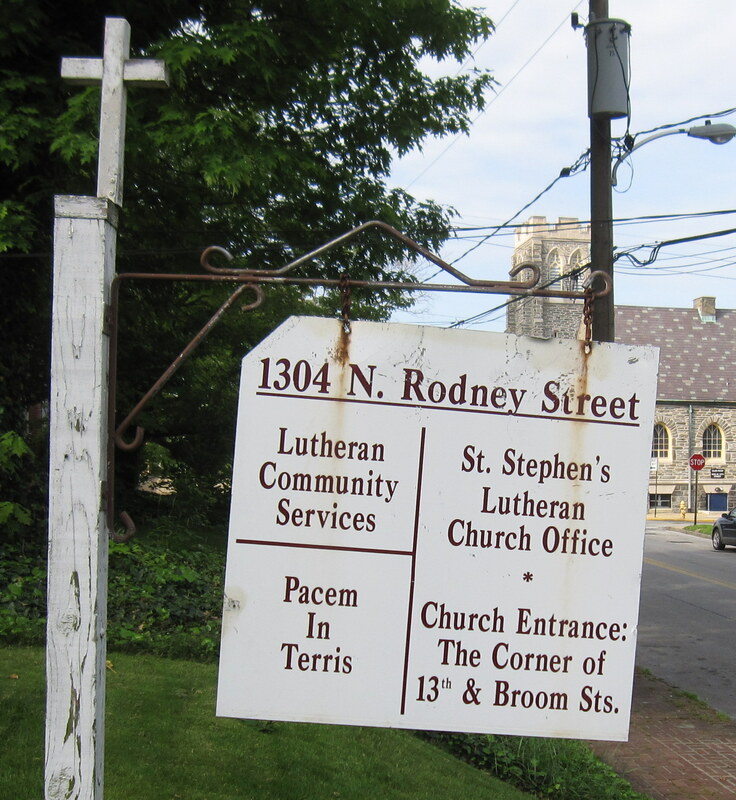 I found that out volunteering this morning with the great people at St. Stephen’s Pantry, a service of Lutheran Community Services (LCS) of Delaware (http://www.lcsde.org/) in Wilmington. 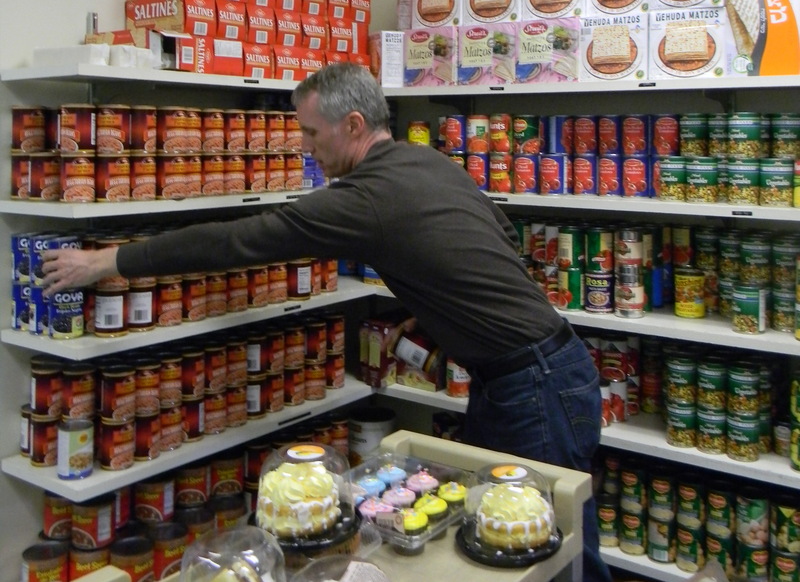 The pantry distributes over a half a million meals to hungry people every year. 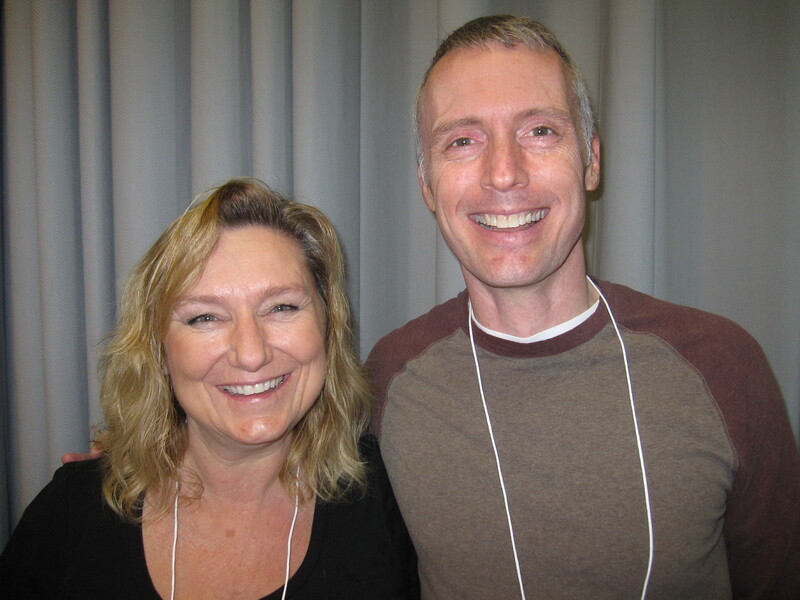 Aaron Ballett, LCS Assistant Program Director, directs the program and Cher Frampton is the LCS Volunteer Coordinator. They both pitched in today when they could because we were short volunteers. Peter Buttenheim, an experienced volunteer and all-around sage, ran the crew today. He told me that a minimum staff should be 5 people. At first it was just Peter and I, which made me glad I was there to help, though in reality Peter had to spend quite a bit of time training me. Volunteer Don Schaeffer later joined us, so at various times there were up to five of us, but most of the time we were just two or three persons. The work comes in waves. The physical part of the job is obvious—someone has to unload crates of food from wherever it comes from—food drives, the USDA, bakeries, and so on. I didn’t have to do that today. But of course, space is at a premium, and supply can be unpredictable—not only do you move food in once and hand it out, but you spend a considerable amount of time and energy moving it around and rearranging it, especially if a massive food drive delivery comes in. And you have to categorize it, and sometimes follow special rules: the USDA requires that its food be stored separately from all other food, even though in the end it all gets mixed together when distributed. Keeping USDA food—crucial to operations—in a separate storage area has led to the loss of a room that could have been used for other purposes. Catching Peter Buttenheim rushing around, making it happen! Which brings me to the mental part. With rules, of course there is paperwork. Regular morning pantry clients must have a referral (they also run a mobile pantry and other programs that don’t require a referral), and that means forms to fill out. I don’t know how many different agencies call in referrals—well more than a dozen. Peter patiently gave me the rundown, but of course being new I goofed up several times, forgetting to record the person’s ID number, or forgetting to have them sign the form. As anyone who works with forms knows, there are always those questions or spaces requiring answers that no longer apply or don’t have the right categories, as the rules change or as unique people present unique circumstances that the form wasn’t made to capture. So you write in extra information, you ignore some questions (ignoring takes mental effort! )–it’s a lot to track, but I suppose after experience you just know how to do it. And then there is the food itself. This morning we were out of many things. There are prescribed menus from which to select items, quantities depending on the number of persons, but what if certain categories of food aren’t available, like today? No meat of any kind? Substitute beans (more beans in addition to the beans they’re already getting). No cereal? Substitute matzoh (not wanted by at least one would-be recipient today). No tomato sauce? Just forget about the pasta. But don’t forget about the special items that may be on hand—like pistachios! Don’t hand out the Girl Scout cookies because there are pastries today with a much shorter shelf life. Filling the bags of food requires constant mental adjustments and new calculations as different foods arrive and disappear, all in one morning. Today we had a bonanza of baked goods to wrap up and top off people’s bags. Which brings me to personal attention. Pantry staff make a point of providing food of good quality—no stale bread, no jelly doughnuts that were smashed with filling oozing out. And when they can, they give people choices. I saw Peter, even at his busiest—with the phone ringing, with people waiting in line, with bags to fill—asking people what they preferred. Would you like chicken cutlets or bacon, or (for families of several persons) one of each? One could easily just decide that people will get what they get, and “damn it, they should be grateful for it.” The ability to choose, even when the options are few and predetermined, is at the core of our concept of human dignity. Peter, Cher, Dan, and Aaron seemed to be all about supporting people’s dignity in any way possible. Despite feeling overwhelmed at times with all the learning required, and wondering if I was being helpful (who’s going to have to deal with any mistakes I might leave in my wake? ), I left the pantry ENERGIZED at 11:45 a.m., a few minutes before it was to wind down, after three hours of buzzing around answering the phone, filling bags, attending to clients, and squeezing in bits of conversation whenever possible. As I write this on the train back to DC (from where I’ll be flying fly home to Seattle this evening), I feel gratitude for the warm welcome and appreciation that the St. Stephen’s Pantry staff and volunteers extended to me—all because I showed up for three hours to do what they do all the time. Where else can I “just show up” in my daily life to make a little difference for someone? Who has suggestions and experiences of their own to share? Welcome to my blog! Over the next year and beyond I will share my random acts of volunteering here. What are random acts of volunteering? Someone somewhere has probably defined it, but for the moment I’m going to say that I think of it as taking advantage of random, informal opportunities to offer myself to people and situations to be of service in whatever way I can be helpful. I’ll explore what this means in more depth in another post. The Random Acts of Volunteering Project is much more than a blog. The blog is merely a tool to hold myself accountable by sharing my experiences in connecting with others and engaging in random acts of volunteering. I hope others may find something of value in reading about my experiences. So I thought I’d try to hit the remaining 8 states over the next year, but I wanted to do something with more meaning. I’ve had a comfortable life and found myself inwardly focused for several years now. I’ve been missing the chance to give something of myself back to others. That’s where I got the idea to do something different, and so I’ve decided to see if I can set up volunteer opportunities for myself along the way. So far I’ve got Delaware and North Dakota planned. I’m in Delaware tonight. 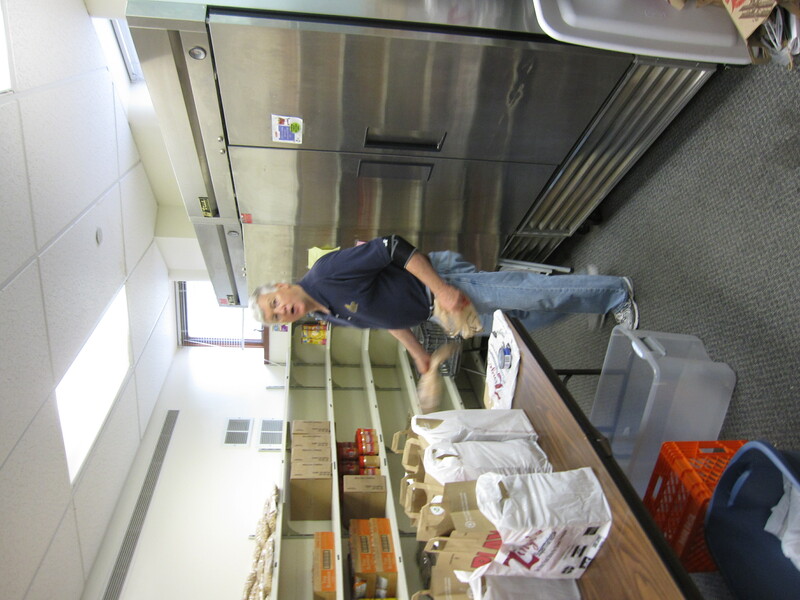 Tomorrow I will work in the morning at St. Stephen’s Pantry, the biggest food pantry in Delaware. This is my first time doing this and I’m really excited about it. My visits are going to be short—typically one night or one weekend. Anyone ever done something like this? Will people trust me? How do I gain people’s trust? How do I make sure that I’m contributing, rather than making more work for people? I’d love to hear your thoughts. Stay tuned….